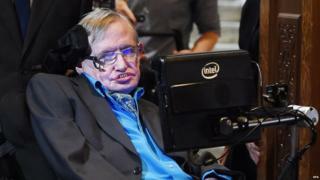 Image caption Prof Hawking says that physical information could be stored on a black hole's "event horizon"
Black holes preserve information about the stuff that falls into them, according to Prof Stephen Hawking. Physicists have long argued about what happens to information about the physical state of things that are swallowed up by black holes. This information was thought to be destroyed, but it turned out that this violated laws of quantum physics. Prof Hawking now says the information may not make it into the black hole at all, but is held on its boundary. In broad terms, black holes are regions in space where the gravity is so strong that nothing that gets pulled in - even light - can escape. At the same time, the laws of quantum mechanics dictate that everything in our world can be broken down into information, for example, a string of 1s and 0s. And according to those laws, this information should never disappear, not even if it gets sucked into a black hole. But according to Einstein's theory of general relativity, the information must be destroyed. This quandary is known as the information paradox. Prof Hawking believes the information doesn't make it inside the black hole at all. "The information is not stored in the interior of the black hole as one might expect, but in its boundary - the event horizon," he told a conference at the KTH Royal Institute of Technology in Stockholm, Sweden. The event horizon is a boundary, or point of no return, where escape from the gravitational pull of the black hole becomes impossible. Image caption Contrary to Einstein's picture, black holes may not have an "inside"
Hawking has been working with Cambridge colleague Prof Malcolm Perry and Harvard professor Andrew Strominger on the problem. They believe that information at the event horizon is transformed into a 2D hologram - a phenomenon known as a super translation. "The idea is the super translations are a hologram of the ingoing particles," Hawking explained. "Thus, they contain all the information that would otherwise be lost." Prof Marika Taylor, a theoretical physicist at the University of Southampton, told BBC News: "Einstein's theory says that matter gets sucked into the black hole, falling behind its event horizon. "Holography seems to suggest that Einstein's picture of black holes isn't right. In particular, it's not clear that there is actually an 'inside' to black holes at all - matter which gets sucked in might get stuck at the event horizon and hang around as a hologram there." But she added that there was no consensus on this. On the question of matter getting stuck at the event horizon, she said: "Nobody really understands the details of how this happens - this is what Hawking is trying to work out and what other related ideas 'fuzzball' and 'firewall' explore too." There's currently little additional detail on the maths behind Prof Hawking's talk, but he and his collaborators plan to publish a scientific paper in coming weeks. Light particles - or photons - can be emitted from black holes due to quantum fluctuations, a concept known as Hawking radiation. Information from the black hole might be able to escape via this route. But, Prof Hawking says it would be in "chaotic, useless form," adding: "For all practical purposes the information is lost." If the information was not in this chaotic form, an observer might be able to reconstruct everything that had fallen into the black hole if they were able to wait for a vast amount of time.